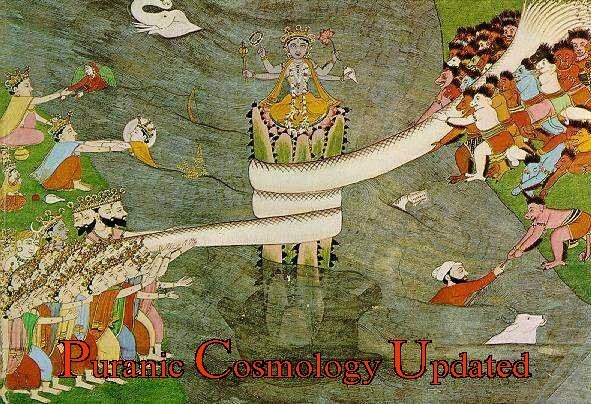 This 'Message to India' on Puranic Cosmology Updated is important food for thought regarding India's straying from the source of it's Vedic gnosis. It will be of interest to those who want to understand Vedic gnosis and the ever-widening discrepancy or gap between so called Vedic astrology (based on the Constellations) and Western astrology (based on the Earth's Equinoxes and Solstice). The correct scheduling of the Kumbha Mela is mentioned as crucial for the realigning process. As a Christian that reads the Judeao Christian scriptures esoterically I have run into the same problems and questions that the author has. The best I can advise is to say that the world as a whole will not conform to the religious point of view because it speaks in the vernacular and religion speaks in the religious or esoteric symbolic tongue. It it very much like trying to get two foreigners each speaking their own language trying to communicate with each other not understanding why the other can not understand the simplicity of what is being said. Personally, I believe that the world has an inherent knowledge that the religious texts are far superior scientifically and intellectually then modern science and its educational systems. It is because of this inherent knowledge that the world fears religion: because such sophisticated intelligence cannot be neither controlled nor manipulated. To see the intelligence and sophistication of religion in comparison to the secular society of the twenty-first century just look at your temples and compare it to the block and cubes that are going up and they call it ARCHITECTURE? REALLY? It does not take much thought to put a block on top of another block. I think to and three year old children can manage that. Intellectually that is what modernity has turned into: children. And religion can not teach children that are not ready to go to Kindergarten classes. Until society as a whole is ready to listen its elders and parents (religious schools of thought) then society will remain as a spoil brat and be summarily dismissed into its own misery. Hi Hari, thanks for your thoughtful response. I will respond soon. I did go through the link and its preceding links - I am not an authority on these things , but I can share some things which I do know with you , if it be of help in anyway I will be vindicated to some extent in my beliefs The Ayanamsa problem in modern times has reached stupendously ridiculous proportions with the consequent spoiling of the environment . The Indian government is to be blamed to a large extent when they found that there were numerous calendars in various parts which were being followed , and in order to introduce a measure of homogenity they appointed a CRC (calendar Review Commitee ) - now all these people got together and came up with some solutions - it is known to "knowers'' that these people themselves were not very convinced about their conclusions - them being pure pundits and people without an iota of Sadhana or intuition . But somehow managed to push in something acceptable to themselves with some reasonings and many lopsided calculations on the assumption of strict mathematical conjectures and allusions in the Suryasiddhanta . According to the age old rule - That one will be made acquainted with what one does not know even against will - During my perigrinations I came across a really unassuming person who was a complete Yogi and who was after realization leading a life as an Astrologer in keeping with his family tradition (He belonged to a particular caste who were astrologers by familial ties and birth ). In his case there had been an unbroken tradition of more than 250 years . In later life we used to keep good contacts and we had a relationship of nearly 20 Years (he was quite advanced in age when I first met him ) I used to visit him on and off whenever I was passing through his village . He did teach me somethings and explain about astrology and celestial calculations which he used to do with some cowrie shells of varied sizes , the sizes denoting powers (x10 ,x100 etc) . Unfortunately I am a bit bad in mathematics so I could not understand the exact calculations though he used to go by ''Kali Yuga Dina Sankhya " (in Malayalam it means the Kaliyuga date . It is something like a star date as in Star Trek , he was not bothered with the usual calendar that we use . He went into Samadhi in 2006 , but he did inform me that his "Time was up'' and that he was leaving shortly and that we would not meet again , and he also asked me whether I had any doubts that he could clear - since at our first meeting , he exclaimed to me on seeing me (I was a sannyasin in robes at that time ) That he would tell me the path that I should pursue . We have sat for meditations together a , small mark of his liking for me , but I was never his disciple or he my preceptor per se . He used to tell me that there are books older than Suryasiddhanta and many calculations were not being done correctly these days and ''Sadhana" was required - according to him an intutive approach was required to really get into the heart of the matter. We have discussed a lot of classical Vedic stuff relating to our interests . Since I was following Advaita which is knowledge based - he used to demonstrate a lot of things and and how Astrology and Cosmology or ''Hora Shastram" as he used to call it (he did not know english) could be used for self realization (himself being a living example ). He was a person who would be labelled as only lowly educated by modern standards but his knowledge far surpassed that of most scientists . He used to quote from the upanishads and the different vedas and samhitas with ease and explain to me in Malayalam , which was our common mother tongue. Once we were discussing the Purusha aspect and how the microcosm and macrocosm were intimately connected , by bijas or Seed (he was also a specialist in removing afflictions real or imaginary for the poor by the use of mantras ). We came to the Ayanamsa aspect of Horasastra - what he told me was very fascinating and quite enlightening considering my inclinations and scope of meditation - he told me that the axis of the earth was not a significant thing , what he told me was that was he used to work with the axis as ''Dhruva Nakshtram" or Pole star (both the northern and southern pole star ) - when I enquired why he demonstrated how such a conception was in keeping with the Purusha Conception and its relation to the Muladhara and he did mention an angle of 270 degrees in relation to that chakra and the Brahmarandra or Brahma Nadi . The seed or bIja was of equal conception for the the Macrocosmic Purusha and the Microcosmic with Mula prakriti taken into account . that in an infinite body , there need not be assumed any movement - if such a conception is used in any theory - for instance what he said was - in relation to the infinite , if our whole universe or whatever moves - it moves together and it does not matter since the body is infinite and so that was the limit of the Purusha and the Muladhara BIja which both were imperishable . I do not know if there is any clarity in what I have written - but maybe the associations can be made by you better . It is not easy for the academicians and plain pundits to go into the esoteric and intutive side of sciences. In any case Lori I know any decent westerner will feel outraged at the lack of scientificality in the average Indian - it can be so upsetting , true analytics is lacking .We are born in a culture which asks us to believe the vedas faithfully and every common man does so - the word Veda is known intutively and belief is there - but since old the Vedas were all one - we did not have a separate sciences and spirituality - all were science - the highest science was the science of the soul - It is only later that classification of sciences as in western thought came to us and there is a mish mash now . We had Darshanas and Upavedas which were our sciences . Now my friend is no more - but his son is carrying on the tradition of his father - he "Transferred" his knowledge before he left to his son .